Khabib Nurmagomedov could be stripped of the UFC lightweight title he won in beating Conor McGregor on Saturday night after he leaped over the Octagon fence and flew into the crowd to attack one of McGregor’s teammates, UFC president Dana White said. 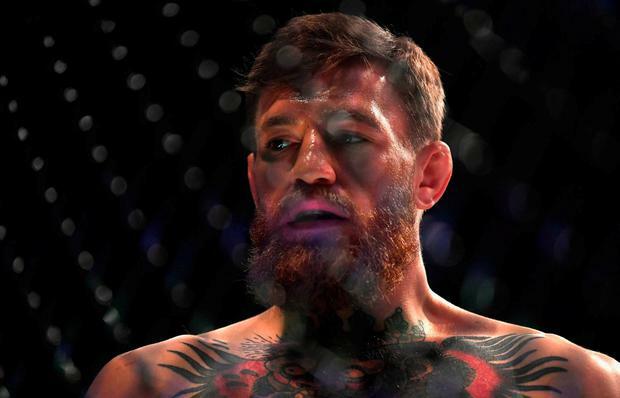 The Russian fighter secured a fourth round submission of McGregor, who was returning to the UFC for the first time in two years after his boxing venture against Floyd Mayweather, but the scenes immediately after the fight turned ugly as the two camps clashed both in and out of the Octagon. Khabib jumped off the apron to attack McGregor’s training partner and Bellator welterweight Dillon Danis, and while a melee broke out outside the Octagon, three of Khabib’s camp jumped into it to attack McGregor – who was still recovering from being choked out. Zubaira Tukhugov, a featherweight with a 3-1 record in the UFC, was one of those involved in the attack on McGregor. UFC president White appeared at the post-fight press conference to apologise for the ugly scenes and attempt to explain what will happen, with Khabib facing strong action from the Nevada State Athletic Commission, who are investigating the matter. White also confirmed that Khabib's purse was being withheld. The bad blood between the two camps stems from McGregor attacking Khabib’s team bus back in April, when the two clashed at the Barclays Center in New York at the UFC 223 media event. The Irishman was seen throwing numerous objects at Khabib’s bus, which was also holding a number of other fighters. That incident led to a hostile build-up to this fight, with McGregor launching numerous verbal tirades towards Khabib and making comments about his religion and background, which ultimately led to the Russian snapping after the fight.